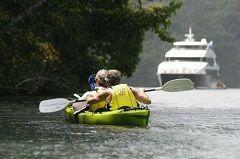 Can you kayak through the Panama Canal? If you love kayaking and you are looking for a trip that will test your skills, reveal rarely seen sceneries, and leave you satisfyingly exhausted, then you will enjoy a thorough exploration of the Chagres River, from beginning to end. And yes, the Panama Canal at Gatun Lake, from Gamboa to Gatun Locks, is nothing else than a section of the Chagres River. This itinerary takes you to experience the essence of Panama, its history, indigenous culture, nature, and the Panama Canal. A dam at the river's northern terminus, just before it meets the Atlantic Ocean, forms Gatun Lake, which makes up the main water body of the Panama Canal. You'll hear the roar of howler monkeys from the vast jungle on your left and spot giant ships from a safe distance on your right as you paddle the length of Gatun Lake, sleeping as a guest in the huts of indigenous Embera tribes and wilderness camps along the way. The idea of a canal across the Isthmus of Panama was first envisioned by Charles V, the King of Spain in 1534. Spanish conquistadors at that time used the natural flow of the Chagres River to transport treasures from the New World to Spain. Mules hauled their booties over land to Gamboa where they took smaller row boats along the Chagres River from Gamboa all the way to the Atlantic. Roughly the same expedition in which you'll explore in its modern capacity on days 4, 5, and 6 of this trip. American interest in a convenient route between the Pacific and the Atlantic oceans was spurred from the gold rush of 1849 and led to the construction of the Panama Railway, finished in 1855. However, France began the first real efforts of building an inter-ocean waterway across the isthmus in 1881, but financial hardships and 22,000 deaths, largely due to disease, brought an end to the project 8 years later. Americans picked up where the French left off and began a massive undertaking, completing the waterway in 1914, a project of great ambition that took 10 years and brought the Panama Canal to fruition. Currently, 4% of world commerce passes through the Canal annually, but a growing demand for global shipping efficiency has made necessary the construction of a thirs set of locks that will allow much larger vessels to pass through the Canal, a project completed in June 2016. Every time a ship crosses the canal towards the Pacific Ocean at Miraflores or towards the Atlantic Ocean at the Gatun Locks, 52,000,000 gallons of fresh water are drawn from Gatun Lake, once the world's largest artificial lake. With the growing increase in traffic and with the addition of new locks, the demand for fresh water will continually rise. Thanks to the Panama Canal, Soberania and Chagres National Parks were established to protect vast tropical forests that generate the Canal's main power source—fresh water. On this trip you'll not only explore the Canal itself, but venture into the heart of the jungle where an impressively large watershed forms the head waters of the Chagres, which is not only vital to the canal but also necessary for supplying the Panama City- Colón area with enough fresh water to support their growing populations. You'll start off with a trek through Chagres National Park on our flagship trip, the Chagres Challenge. You'll visit a virtually unseen portion of the jungle, due to the lack of accessible roads, protection against settlers, and the previous non-existence of Adventures Panama. This part of the river, characterized by currents alternating with still waters, is considered Class II, although several rapids are considered Class III by the International Classification of River Navigation. After this rafting portion of the trip, you'll switch into expedition kayaks and begin the real paddling as you cross Madden Lake ("Lago Alajuela"), before entering Gatun Lake alongside the Panama Canal. With the creation of Gatun Lake, many mountain tops were turned into islands. This area offers endless channel possibilities to scout. In its shores covered by dense tropical forest you will find all kinds of exotic flora and fauna. This was discovered by the Smithsonian Research Institute which has operated the famous Tropical Research Center at Barro Colorado since 1946, an Island you'll observe from your kayak as you paddle around it on your way across Gatun Lake. At the Northern end of Gatun Lake, you'll once again enter the remnants of the Chagres, as you take the river from Gatun Dam all the way to the Caribbean, ending your time on the water with a tour of Fort Lorenzo, a fortress that once guarded Spanish conquistadors from the infamous Caribbean pirates. We will greet you at Tocumen International Airport and shuttle you to a Panama City Hotel. At the hotel, we will hold a welcome meeting for the group at 7 p.m. in the lobby. You will learn about the development of the Panama Canal and its economic impact at the Miraflores Locks. Here, you are able to see passing ships and you can enjoy a documentary about the creation of the canal, its economic and strategic impact, and the recent expansion of the Canal. On the Amador Causeway you will be in awe of the beautiful sight, here 3 islands were connected with the mainland by using materials from the Panama Canal excavations. You get to choose from several gourmet restaurants and enjoy the view of ships leaving the Canal and the exciting city. Get ready for an early start at 5 a.m. You will be picked up and taken in an all-terrain vehicle to the remote village of San Cristobal, which is past the mountains of Cerro Azul, northeast of Panama City. After a wild 4x4 drive through our own made highway, you will hike for about 2-3 hours on a trail within Chagres National Park, up to Rio Piedras, a Chagres River tributary or all the way to Chagres River. Here you will get into rafts and float downstream (Class II-III rapids) into the untouched jungles of the upper basin of the Chagres River. We will have lunch by the river and continue rafting further downstream passing an impressive granite canyon with some white water rapid action, and ending just before encountering Madden Lake, also known as Lake Alajuela. Along the route, you will be picked up by a “piragua” (native wooden canoe equipped with outboard motor) that will take you to the Embera Indian Village around 4-6 p.m. These Embera Natives migrated to Chagres National Park more than 20 years ago, here they found habitat similar to the one they were familiar with in the Darien jungles, near Colombia. They are extremely friendly and will invite you into their village as honored guests. You will most likely set up camp under one of their banana roofed huts and be served their staple dinner of fried plantains and locally caught fish. After thanking the Embera Natives for their kind hospitality, we will switch our rafts for expedition kayaks and begin paddling across Alhajuela Lake, for 3-4 hours. You will paddle through the remains of a 'drowned forest,' where only the very tips of the tallest trees, that once thrived here, now barely break the surface of the water in this man-made lake. You will navigate through the water channels as you make your way to the public boat ramp of Nuevo Vigía, on the western coast of Alhajuela Lake. Here, the driver will meet you, and shuttle you across Madden Dam to a section of the Chagres that connects Alhajuela Lake to Gatun Lake. This leg of the trip will take around 3 hours, you'll be able to spot wildlife on either side of the river, it's even possible to see small alligators. At the end of the day, around 4pm, you'll stop at another Embera village for the night, just short of Lake Gatun and the town of Gamboa. If they have ample space and resources, then you will once again indulge in their hospitality, setting up camp in a hut and eating locally sourced fish. In the morning, Embera Natives will once again shuttle you in piraguas, this time you will travel across to the west side of the Panama Canal. From here, your exploration of the canalthrough the original locks). With the expanded Canal, you might also see larger Neopanamax that are crossing through the newly inaugurated Third Set of Locks. Eventually, you'll make your way around Barro Colorado, a famed Smithsonian natural research island. For this you have to rely on navigational techniques, to make your way through the tropical islands that guard the western passage around Barro Colorado. On the far side of Gatun Lake you will see ships lined up, waiting for their turn to enter the locks and continue their passage through to the Atlantic Ocean. Large families of howler monkeys are known to roam the jungle forests in this area and will no doubt applaud your completion of Gatun Lake with their signature howl. You will be put in directly downstream of Gatun Dam just in time to watch the jungle awaken, likely encountering some morning mist. This is the final stretch of the Chagres River which flows into the Atlantic Ocean. To get in and out of this area, by road, we will go across the Panama Canal by way of the ferry boat in our vehicle. This land package is designed for couples, friends, or singles above 18 yrs old that enjoy to team up for paddling in the outdoors. Lodging has been chosen considering local style, comfortable and basic accommodation with out luxury. However, any person from 12 to 65 years old, in good health, ready to walk for about two and a half hours through an irregular and muddy path could do it with slight modifications(Minors must travel with a responsible adult). Daily items: Swimsuit or a pair of shorts for navigating, sneakers or light boots with good soles, a cap, sun-block, a light jacket or windbreaker (in case the weather turns chilly), a towel and dry sets of clothes for after the day trip. Blanket, flashlight, personal hygiene items. Objects than can be deteriorated by water or valuables like jewels, cash, credit cards, etc. 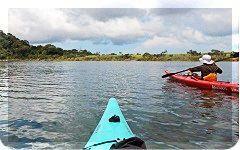 Kayak through the Panama Canal year-round ! The rainy season in Panama starts in April-May and ends by November-December. Due to changing river water levels it can not be defined in advance where we will stay the night on river shore. (2) Participants should become familiar and agree with Aventuras Panama Terms and Conditions.